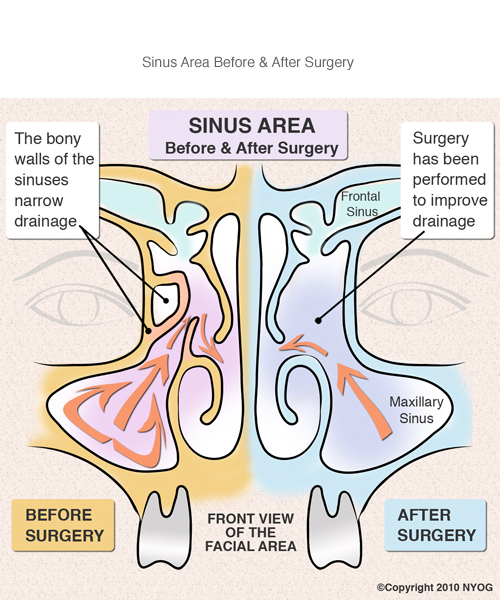 Minimally invasive, targeted surgical techniques which spare normal healthy tissue and which are designed to restore and enhance the normal function of the nose and sinuses are widely recognized as the most effective approach for treating sinus disease. The New York Sinus Center has been using the most advanced procedures for more than a decade to treat patients with chronic sinus conditions. As new equipment and techniques develop our doctors evaluate and adopt them when deemed useful. We have found Balloon sinuplasty to be an important tool in the surgical treatment of sinus patients. This new technique uses inflatable balloon-tipped catheters to dilate narrowed sinus openings, without removing tissue. This is similar to the procedures used in cardiac catheterization and very useful in certain cases. 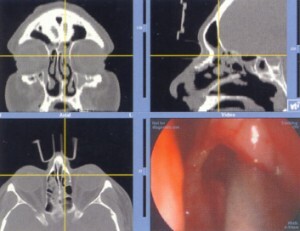 Balloon sinuplasty is often combined with minimally invasive endoscopic techniques in what is know as hybrid surgery where some irreversibly diseased tissue (tissue too diseased to recover) must be removed in order for the sinuses to heal properly and regain normal function. In sinuplasty surgery, a catheter-fed guide wire is run up into the targeted sinus. A balloon is taped over the wire and inflated against the blocked ostium. Once the balloon is removed, the bony passages are permanently opened, allowing the sinuses to drain properly. In the 1970s, Austrian otolaryngologist Walter Messerklinger, a professor in Graz, Austria, observed that gently clearing or unblocking the narrow areas between the nose and sinuses using nasal endoscopes and delicate surgical techniques, would promote normal mucus drainage and restore sinus health in chronic sinus patients. The introduction of the microdebrider in the early 1990′s helped to popularize this approach. This electrically powered instrument can shave away and remove diseased tissue one thin layer at a time, leaving healthy tissue unharmed. It encourages gentle dissection of the tissues and does not damage the healthy anatomy as is common with traditional instruments. Quick healing usually follows this gentle surgical technique. For more information read our Case Study before and after sinus surgery. Black and white images are CT scan images of actual position of surgical instruments (cross hares) in 3 dimensions during surgery. The color image is what the surgeon is seeing thru the endoscope at the same time during the surgery. Another major advancement in sinus surgery, developed in the 1990′s, is known as Image Guided Sinus Surgery. During the surgical procedure, the surgeon monitors a 3-dimensional CT scan hosted on a powerful computer workstation in the OR. The patient is connected to the computer with a headset that is placed after anesthesia is given. Computer generated images show the surgeon the actual position of the surgical instruments during the surgery in all 3 dimensions. With this perspective, the surgeon can pinpoint areas of disease as well as maintain ideal positioning of surgical instruments in the complex and delicate sinus cavities and their surrounding vital organs, providing a real-time surgical road map. This image guided technique has dramatically improved surgical accuracy, leading to more consistent results, shortened operating and anesthesia time.